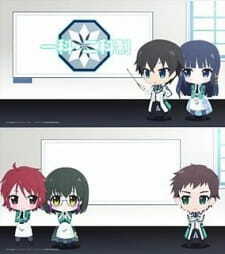 Sequel: Mahouka Koukou no Rettousei: Yoku Wakaru Mahouka! - Saiseitte Nani? Honestly what are these ONA's? These are so pointless that I decided I'd watch it once for one of my favorite anime and I was left thinking "What the hell is this?" This is useless information that the audience honestly does't need to know to watch and enjoy the anime, Mahouka Koukou no Rettousei yet they decide to spend money and create this useless thing. Not one, Not two, Not three, Not four, Not five, But 6 friggin episodes of it. Completely useless and boring, don't watch it. The Irregular at Magic High School is a bit tough to follow and understand for the average viewer. It's a very scientific anime, which I love, and even a sciency person such as myself had to watch it a couple of times to get a full understanding of the science and magic behind the series. This ONA is a great watch to get a head start on the show before watching it. I'd say it's almost essential to watch. The best part is it's short and sweet and to the point and the chibi characters are pretty cute and gives the main characters a quick introduction. This short introduction 3 part OVA is essentially the survival kit for the world of Mahouka Koukou no Rettousei. The world of the magic high school is quite a blur for those who just jumps into the anime without background knowledge from reading either the Light Novel (LN) or read the manga previously. Those who did will know of the explanation of the world structure & magitek are mighty complex, which will make or break those who want to watch the series anime. It's nice to now the company behind Mahouka do this extra little introduction (via moeified characters) doing some basic explanation vs. just leaving them out (*cough*SAO*cough*) or making the main series drag by information overload. I however, recommend only for those who haven't been introduced to the world of Mahouka Koukou no Rettousei beforehand. For the fellow LN or manga readers, feel free to jump right into the main series.